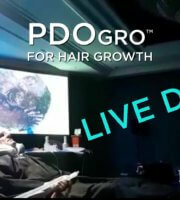 What are PDO MasterThreads for Hair Regrowth? 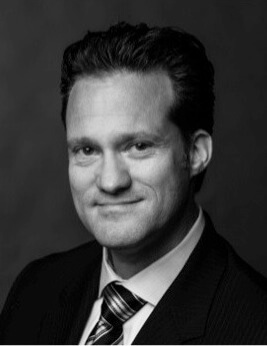 Hair Restoration Physician Dr. Alan J. Bauman is first to use PDO MasterThreads PDOgro™ Procedure for Hair Regrowth in the U.S.
PDOgro™ Procedure using MasterThreads for Hair Regrowth – PDO is a known absorbable FDA-cleared synthetic suture and surgical scaffold material which stimulates endogenous collagen production, elastin, hyaluronic acid as well as activates fibroblasts. 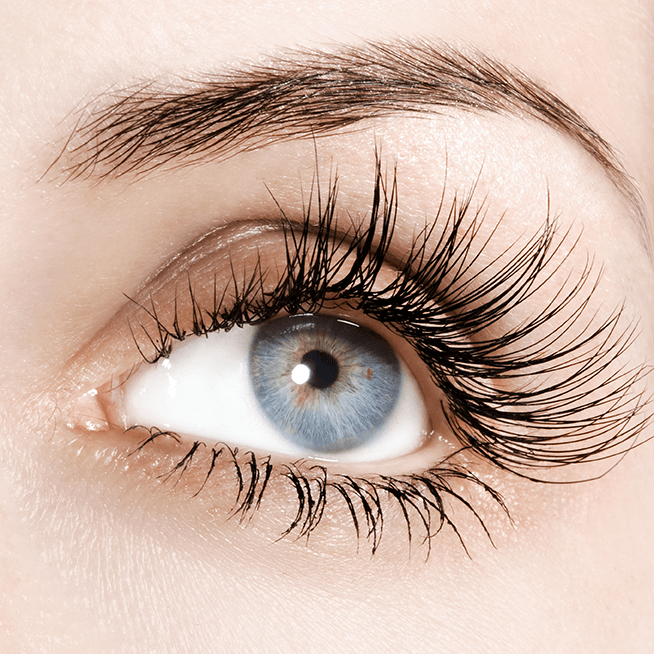 PDO (polydioxanone) threads have been used in aesthetic medicine for years for rejuvenation of skin, skin tightening, skin lifting, and wrinkle reduction. 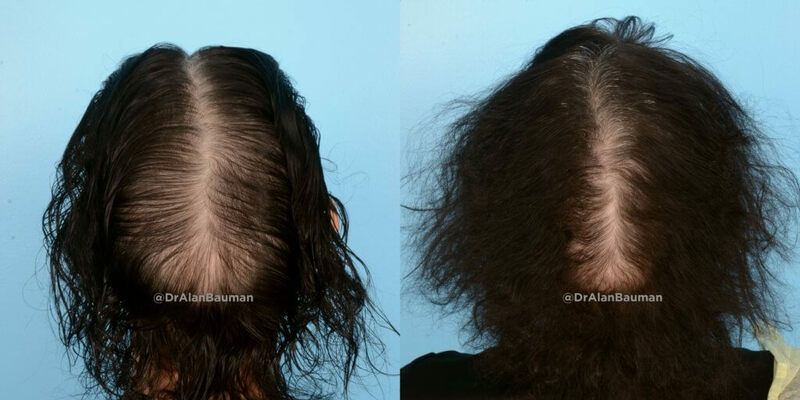 Hair regrowth in patients with hair loss from androgenetic alopecia has been observed in patients who had PDO threads inserted into their scalps. 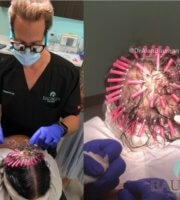 In this video you see ABHRS-certified hair restoration surgeon, Dr. Alan Bauman, performing the final step of his proprietary PDOgro™ process using MasterThreads in the thinning crown area of a hair loss patient “C.T.” Continued research will help determine how long the results of MasterThreads last and which candidates are likely to have the best hair regrowth effects. 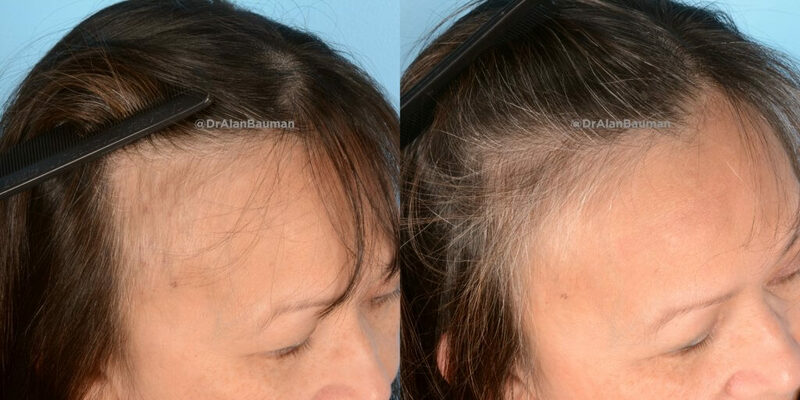 Non-surgical application of PDO threads into the scalp is a relatively safe and comfortable out-patient procedure with no downtime or aftercare. 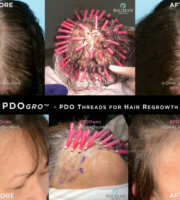 The PDOgro procedure using MasterThreads for hair regrowth may help prevent or reduce the need for hair transplantation. 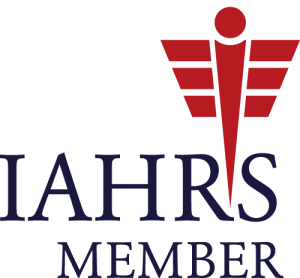 They may also be used for stopping, slowing or reversing hair loss in conjunction with other treatments such as minoxidil, finasteride, low-level laser therapy, PRP platelet rich plasma, and other cell therapy treatments. 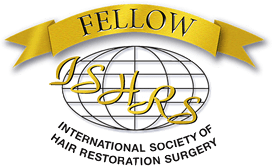 Dr. Bauman recommends that HairCheck hair regrowth measurements be performed every three months (90 days) to track the improvements in hair growth from treatment and to help determine when the next PDOgro thread treatment for hair regrowth is indicated. 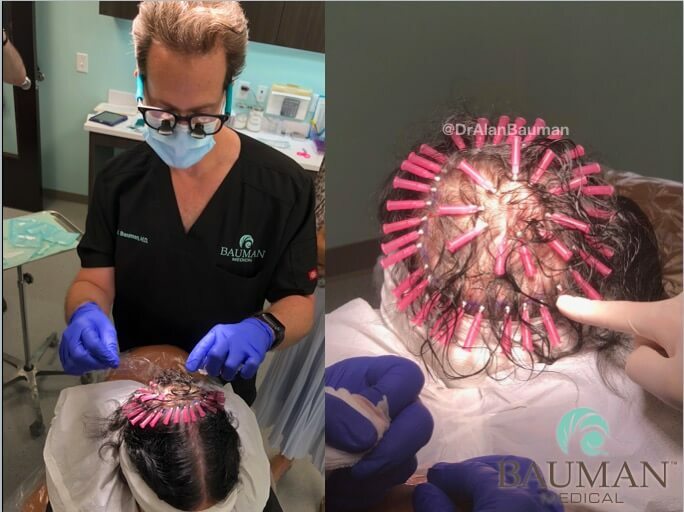 Clinical trials are now underway at Bauman Medical to determine how long the hair growth improvements with PDO threads will last as a stand-alone treatment, as well as with the addition of PRP at the time of insertion. In these two patients below, the results were already beginning to become visible to the naked eye around 12 weeks (3 months). 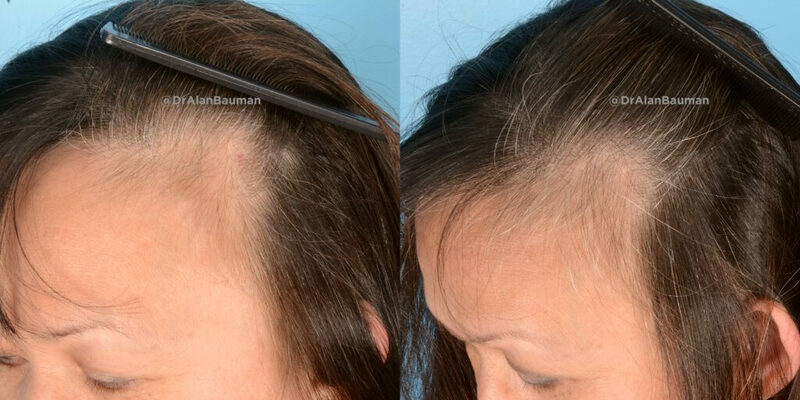 Patient “M.M.” had PDO threads inserted at the hairline, right and left temple area. Patient “C.T.” had PDO threads inserted in the crown/vertex area. Stay tuned for more updates soon!